Perfect for your garden, lawn, and backyardand even for patios, decks, and balconies right in front of your home! Doublesized to give you even more space to store your plantings. - It is structured with durablerust-resistant tubes that will make this portable greenhouse last through theseasons. - 12 wired shelves allow for you to placesmall plants, gardening tools and pots, and has ample room for all yourgardening supplies or plants. - Designed with zippered roll-up door foreasy access and screened ventilation for optimum air circulation. - Ideal for starting seedlings, protectingyoung plants, and for extending the plant growing season. -Unfold Dimension: 56"L x 56"W x77"H.
Please make sure all the tubes areinstalled in place with no gap. Garden Walk-in Greenhouse: Greenhouse protects plants and seedlings from elements of weather and climate. Which makes space for all your blooming flowers, sprouting plants and fresh vegetables, Walk-in design offers growing space and ventilation for large size plants. Diverse Uses Of Space: 3 Tiers 12 shelves which can hold enough plants, gardening tools, etc. Tie the cover to the frame so that the greenhouse will be sturdy and stable. Smart Design: Walk-in design offers growing space and ventilation for large size plants. Zippered roll-up door for easy access and screened ventilation for optimum air circulation. 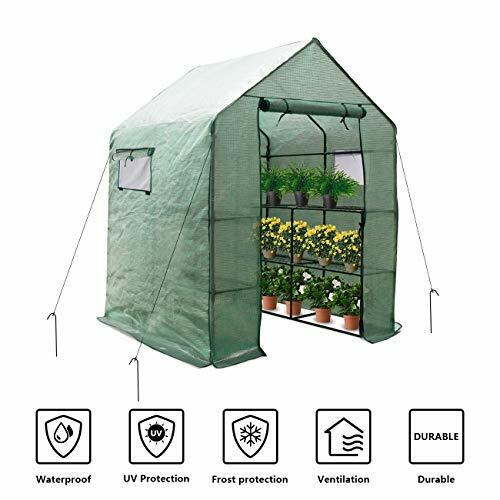 Comes with PE cloth cover, 100% Waterproof, UV protection, maximum solar performance, keep the greenhouse inside warmer and help to extend plant growing seasons. Easy movement and assembly: No tools are required for assembly. Designed with zippered roll-up door for easy access and screened ventilation for optimum air circulation. Ideal for extending growing season or plant protection. Product Dimensions: 57"L x 57"W x 77"H. It's great for use on patios, balconies, decks and gardens. If you have any questions about this product by LINLUX, contact us by completing and submitting the form below. If you are looking for a specif part number, please include it with your message.